The parliament today reversed import duty hikes for garments and motorcycles, three weeks after increased rates came into force. Higher tariffs approved by parliament in December as part of revenue raising measures proposed by the government came into force on April 1. However, days before the changes took effect, economic development minister Mohamed Saeed told the press that the government was reviewing the new rates as motorcycles had become “a basic need in the Maldives”. The custom duty for motorcycles had been raised from 100 to 150 percent. A marketing executive at Sheesha Pvt Ltd, one of the largest automobile whole-sale and retail traders in the country, told Minivan News today that the company has not increased prices as its last shipment arrived before April 1. Sales picked up dramatically in early February and its stock of motorcycles was completely sold out before April, the executive said. In late March, hundreds of people queued up to buy cigarettes before import duties on tobacco was hiked from 150 to 200 percent and from 90 laari to MVR1.25 for a single cigarette. The amendments passed today also require the customs authority to reimburse motorcycle importers who were charged the hiked rates from April 1. However, Sheesha does not expect a reimbursement as its new shipment has not cleared customs yet. According to a 2011 report by the Environment Protection Agency, one in six residents of the capital own a motorcycle. 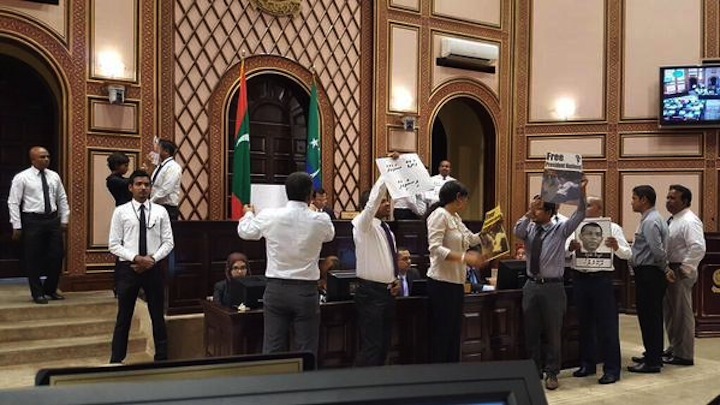 Debate and voting on the government-sponsored legislation meanwhile took place today amid continuing protests by opposition Maldivian Democratic Party (MDP) MPs. The amendments to the import-export law submitted by Progressive Party of Maldives (PPM) MP Jameel Usman were passed with 46 votes in favour. The import duty for ready-made garments was raised from zero to 15 percent in April last year. The rate will be brought back to zero once the amendments are ratified. MP Ahmed Nihan, parliamentary group leader of the PPM, said today that discussions are ongoing with the government to reduce tariffs for other items as well, including heavy-duty vehicles used for construction. Former minister Mahmoud Razee told Minivan News earlier this month that the government was “flip-flopping” with its policy reversals. In December, the government also reversed a decision to impose a 10 percent import duty on staple foodstuff such as rice, flour, wheat and sugar. “There’s no clear-cut, defined, long-term policy,” the economic development minister under the MDP government said. This year’s record MVR24.3 billion (US$1.5 billion) state budget includes MVR3.4 billion (US$220 million) anticipated from new revenue raising measures. In addition to revisions of import duty rates, the measures include the introduction of a “green tax” in November, acquisition fees from investments in special economic zones, and leasing 10 islands for resort development. The government expected MVR533 million (US$34.5 million) in additional income from import duties. On April 1, the import duty for oil or petroleum products was raised from zero to 10 percent while duties for luxury cosmetics and perfume was increased from zero to 20 percent. The import duty for cars, vans, and jeeps was hiked to 200 percent. Import duties were also raised in April 2014 for most items, including textiles, cotton, sugar confectionaries, iron, steel, diesel motor oil, and seat covers of passenger vehicles. Speaker of Parliament Abdulla Maseeh Mohamed has proposed an amendment to the parliamentary rules of procedure to require a vote to accept a resolution before opening the floor for a debate, opposition Maldivian Democratic Party (MDP) MPs have revealed. At a press conference today, MDP MP Imthiyaz Fahmy explained that Speaker Maseeh – a member of the ruling Progressive Party of Maldives – had sent a letter to the general affairs committee requesting the revision. If the amendment is brought to the rules, Imthiyaz explained that resolutions submitted by the main opposition party would not be put up for a debate. A vote would first be called on whether or not to accept the resolution. The MP for Maafanu North noted that a resolution he submitted in July calling for a parliamentary debate on a controversial decision by the Judicial Service Commission clearing Supreme Court Justice Ali Hameed of misconduct has yet to be tabled in the agenda by the speaker. Opposition Maldivian Democratic Party (MDP) MP Ali Mohamed has joined the ruling Progressive Party of Maldives (PPM), Speaker Abdulla Maseeh Mohamed announced at today’s sitting of parliament. The defection of the MP for Noonu Holhudhoo brings the PPM’s number of MPs to 41. The opposition MDP has 24 MPs followed by the Jumhooree Party (JP) with 13 MPs and the Maldives Development Alliance (MDA) with five MPs. The religious conservative Adhaalath Party has one MP while Madaveli MP Muaz Mohamed Rasheed remains the sole independent. With the new signing, the PPM-MDA coalition has now secured a comfortable majority of 46 MPs in the 85-member parliament. Although the PPM won 33 seats in the March 22 parliamentary polls, four out of five independent MPs along with MDP MP Mohamed Musthafa and two JP MPs switched to the ruling party. Elected to the 17th parliament on a Dhivehi Rayyithunge Party (DRP) ticket, Ali Mohamed quit the party in mid-2011 and joined the MDP in April 2013. Today’s sitting of parliament was meanwhile adjourned by Speaker Abdulla Maseeh Mohamed after proceedings were disrupted by MDP MPs raising consecutive points of order and subsequent verbal sparring between opposition and pro-government MPs. MDP MPs insisted that the legislative process could not begin in the absence of standing committees to review bills after preliminary debate. Maseeh had also called off last week’s sitting under similar circumstances after announcing that discussions would be held with political party leaders to resolve the dispute. However, raising points of order, JP Leader Gasim Ibrahim and MDP Parliamentary Group Leader Ibrahim Mohamed Solih denied that the parties were consulted before a sitting was scheduled for today and accused the speaker of misleading the public. Shortly thereafter, Maseeh adjourned the sitting after PPM Parliamentary Group Leader Ahmed Nihan suggested a recess to hold discussions with party leaders. At last week’s sitting, pro-government MPs had accused the opposition of obstructing Majlis to thwart the government’s legislative agenda, while MDP MPs accused the ruling coalition of attempting to create “a one-party state” without parliamentary oversight. Referring to MPs crossing the floor, JP MP Ilham Ahmed had accused the speaker of stalling as the government had not finished “hunting” for new MPs. The protracted dispute over the allocation of seats on standing committees has left parliament deadlocked since the first regular sitting on June 2. A five-member select committee – comprised of representatives from the five political parties – was formed at the sitting to constitute the 13 standing committees. The committee has so far been unable to reach an agreement while a two-week deadline stipulated by parliamentary rules elapsed last week. Following the cancellation of last week’s sitting, the select committee held a meeting on Saturday at the request of the speaker. However, the meeting was cancelled due to loss of quorum after MDA MP Ali Mauroof walked out ahead of a vote on a proposal by the MDP. As parliamentary rules dictate proportional representation in standing committees for political parties based on the number of MPs in each party, the PPM-MDA coalition with its 46 MPs are entitled to a majority of seats on all 13 committees. While not insisting on a majority on key government oversight committee, the MDP has demanded four seats in the government oversight committee, independent institutions oversight committee, and public accounts committee. “After PPM, MDP holds the highest number of seats. So as per regulations, after PPM selects its committees, it is MDP that must get the second choice. However, in reality, PPM is allowing MDA – which holds only five seats – to have its say over that of the MDP. This is not how it should be done,” MP Ibrahim Mohamed Solih explained to Minivan News last week. The select committee meanwhile held a meeting following the adjournment of today’s siting. However, with the MDA unwilling to forego any seats on oversight committees, MPs on the select committee has not been able to reach an agreement as of the time of press. Today’s sitting of parliament has been called off by Speaker Abdulla Maseeh after opposition Maldivian Democratic Party (MDP) MPs raised consecutive points of order objecting to the composition of the Majlis’ 13 standing committees. 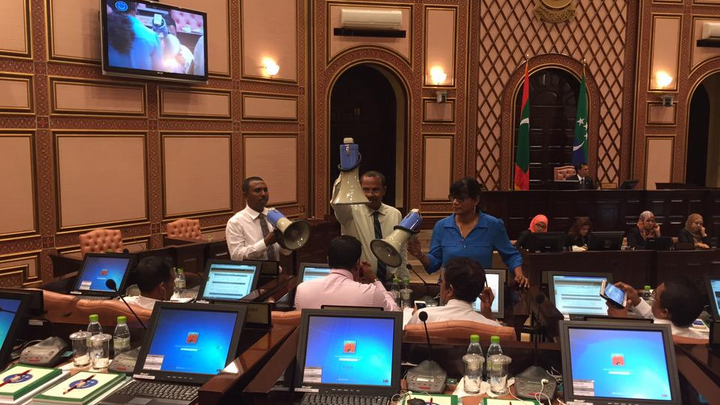 Government-aligned MPs accused the opposition of obstructing proceedings to thwart its legislative agenda. The standing committees were constituted yesterday by a select committee with the ruling Progressive Party of Maldives (PPM) and coalition partner (MDA) securing a majority on government oversight committees. The five-member select committee – comprised of a representative from the five political parties in parliament – approved the composition of committees after MDP MP Ibrahim Shareef walked out of yesterday’s committee meeting in protest, contending that the seat allocation was unfair. 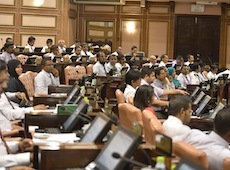 The committee’s decision will be put to a vote on the Majlis floor on Monday (June 23). At the beginning of today’s sitting, Speaker Maseeh gave the floor to MP Rozaina Adam to present legislation on medical negligence ahead of a preliminary debate. “And we don’t know when [the standing committees] are going to be formed. So our People’s Majlis is in a state today where we cannot even envisage when the committee is going to be formed and when it would be able to consult relevant authorities and work on the bill,” she said. Rozaina said she wished to make changes to the bill after consulting the Medical Association of Maldives, after which it be resubmitted as soon as standing committees are constituted. Speaker Maseeh, however, insisted repeatedly that parliamentary rules allow for the formation of ad hoc or select committees to review legislation. The report forwarded by the select committee formed to constitute standing committees will be tabled in the agenda for Monday’s sitting, he added. MP Ibrahim Shareef – who represented the opposition party in the select committee that approved the standing committee composition – contended that the legislative process could not begin in the absence of standing committees. While the MDP had been willing to compromise on the committee composition, Shareef said the PPM did not want the opposition party to have a voice in parliament or be able to exercise oversight. The ruling party had begun efforts to “create an autocratic one-party state like we had 30 years ago,” he said. In the wake of the select committee decision yesterday, Shareef told reporters that the opposition party would be forced to resort to direct action if its MPs were not afforded the opportunity to hold the government accountable through parliament. Jumhooree Party (JP) MP Ilham Ahmed accused the speaker of stalling as the government had not finished “hunting” for new MPs. Two JP MPs signed for the PPM yesterday, joining a number of political appointees who have switched to the ruling party in the wake of the termination of the agreement between the former coalition partners. MPs who leave their party should be “ashamed” of themselves, the JP deputy leader said. “We will not allow a brutal and autocratic rule. You should believe, we saw two or three MDP working alone courageously,” he said, referring to the MDP MPs’ efforts in the Special Majlis or constitutional assembly convened to revise the constitution. “We will see that here again. So I don’t believe the Majlis can carry on before committees are formed,” he said. Pro-government MPs meanwhile accused opposition MPs of attempting to stall parliamentary proceedings and obstruct the government. PPM MP Saud Hussain accused opposition MPs of scheming to disrupt parliament with points of order and prevent debate on government-sponsored legislation. 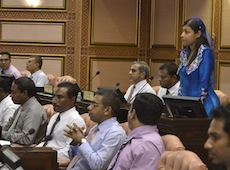 PPM MP Riyaz Rasheed – chair of the select committee that determined composition of standing committees – urged the opposition party to resolve disputes peacefully through dialogue. “There’s nothing you can make us do by yelling. We should do things peacefully,” he said. PPM MP Ali Arif argued that the opposition party had no grounds to complain as the party had been granted 39 seats on the standing committees, which reflected the party’s numbers in parliament. Moreover, he added, the absence of standing committees was not a problem at the moment as preliminary debate had not been completed for any piece of legislation so far. Former President Mohamed Nasheed meanwhile stated on social media that standing committees should be formed in accordance with “the spirit of the constitution” to allow parliament to hold the executive answerable. “MDP is the party that represents the whole Maldives. 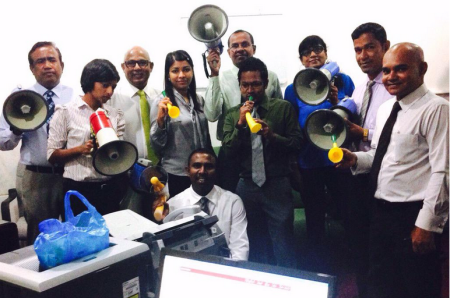 Thanks to MDP MPs,” the opposition leader tweeted. Parliament began regular sittings today, with reviewing the rules of procedure and constituting standing committees the first orders of business. “This will be a Majlis that produces results. We will debate and discuss. But it will be done to produce results,” said newly elected Speaker Abdulla Maseeh Mohamed. A proposal by Maseeh to form a five-member select committee to draft standing orders, and to follow the rules used by the outgoing parliament in the interim, was approved with unanimous consent of 72 MPs. Mohamed ‘Kutti’ Nasheed from the ruling Progressive Party of Maldives (PPM), Ahmed Amir from the Maldives Development Alliance (MDA), Anara Naeem from the Adhaalath Party (AP), Hussain Mohamed from the Jumhooree Party (JP), and Mariya Ahmed Didi from the opposition Maldivian Democratic Party (MDP) were chosen for the select committee. A second five-member select committee – consisting of Riyaz Rasheed from the PPM, Gasim Ibrahim from the JP, Ali Mauroof from the MDA, Anara Naeem from the AP and Ali Azim from the MDP – was meanwhile formed to constitute the 13 standing committees of parliament. Parliamentary rules dictate proportional representation for political parties in the standing committees based on the number of MPs in each party. The rules stipulate that the committees must be constituted within two weeks of the session beginning. The 13 standing committees includes four committees dealing with affairs of parliament in addition to nine oversight committees. Both select committees formed at today’s sitting held their first meetings today, electing chairs and deputy chairs. Mohamed Nasheed and Anara Naeem were elected chair and deputy chair, respectively, of the committee selected to review the regulations. Riyaz Rasheed was elected chair of the select committee formed to constitute standing committees while Anara Naeem was elected deputy chair. After adopting committee rules, Chair Riyaz Rasheed requested that political parties notify the committee of the number of its MPs as well as any changes to party affiliation. The ruling PPM is the majority party in the 18th People’s Majlis with 38 MPs while the opposition MDP is the minority party with 25 MPs. The PPM-MDA coalition has 43 MPs while former coalition partner JP has 15 MPs. The religious conservative AP has one MP while Madaveli MP Muaz Mohamed Rasheed remains the sole independent. Speaker Maseeh meanwhile commenced his first sitting in the speaker’s chair with an appeal for all MPs to provide assistance and cooperate for fulfilling parliament’s constitutional responsibilities. The veteran PPM MP said he was mindful of the challenges parliament would face as well as the considerable amount of work to be done, adding that the current parliament had the “capacity” to fulfil its duties.